Good morning/afternoon/evening, guys! Happy Friday to you. This week’s been a slow week. I think there’s been some misinformation leading to people thinking that everyone’s already moved over to the UK and has settled into office life, this is not actually the case! Those of us who are moving are doing so in mid-April to early May, so while Tiy and some of our other UK employees have set up the office and have been working there, a lot of us have been scrambling around collecting necessary documents and preparing to move our lives across the ocean. Several team members were doing that this week (or coming back from GDC, or breaking their tailbones, or just moving house in the US). I know, I know, we’ve been talking about this stuff for ages now and you don’t care, you want a big update. Sorry. 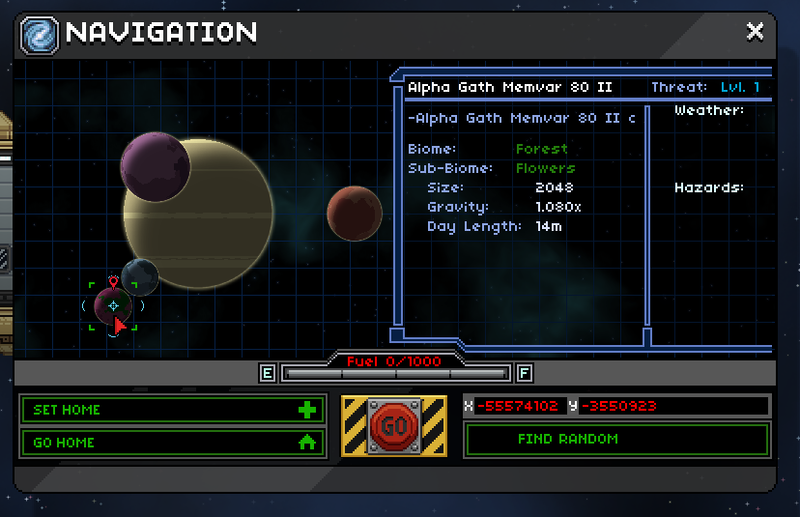 We’re also working to improve navigation, giving you access to more useful info about planets. Answers to the important questions, like, “Will my beautiful sunlit forest cottage be unceremoniously crushed under the weight of an enormous meteor?” Here’s a WIP screenshot of the new UI (above). And, as Tiy posted in an update earlier today, we’ve been working on the monster gen for very large flying/swimming monsters. They look cooooool and I am excited.